In 2017, we had an unparalleled opportunity for Detroit, the region and beyond. With the 50 year commemoration of the tumultuous summer of 1967, our community could have let this important moment in history pass – and just been an unpleasant and troubling reminder> Instead, we used it as a catalyst to engage, reflect and provide opportunities to take the collective action that can help move our community forward. The Detroit Historical Society, through its Detroit 67: Looking Back to MOVE FORWARD community engagement project, has taken the lead to convene an unprecedented community-wide effort. An outcome of this multi-year project has been the creation of a model for bringing diverse voices and communities together around the effects of a historic crisis to find their roles in the present and inspire the future. The Detroit 67 Project and its centerpiece, the Detroit 67 Exhibition, covers a period of 150 years. We look back 100 years – from 1917 to today and forward 50 years to 2067 and use an understanding of our collective history to inform and define our future. Those who engage with Detroit 67 will be able to better understand the events leading up to July, 1967, where we are today, and connect to efforts that are moving Detroit forward. The Detroit Historical Society is engaging thought leaders, community partners, the business, non-profit and policy community, residents of all backgrounds, experiences and generations from across the region to be part of this comprehensive effort. We are engaging community members in a number of ways. Hundreds of individual perspectives will help us tell this story – from people who were active community members in Detroit during 1967 to people with no direct recollection of what occurred. To ensure their stories are collected and preserved forever, a key part of our project is the creation of the largest collection of oral histories ever amassed on this subject, that will be universally accessible through an on-line digital database. These stories then form a unique and indispensable resource for the development of the Detroit 67 Exhibition. Individuals are also sharing their expertise and their experiences as we develop our exhibits and programs. For example, we have engaged local and national scholars and diverse community members as partners with our curatorial and exhibit development teams to be sure the history we tell is comprehensive, complete and balanced. The reflection component of our project is embodied by the museum exhibition that will debut at the Detroit Historical Museum in the spring of 2017. This is our core strength. We understand this is a difficult story, but we aim to give history a face and will make our exhibition an experience that moves people and can serve as a catalyst for change. It will be high-tech, high-touch and thought-provoking with state of the art technology blended with tactile installations. Visitors will be immersed in history, their senses activated and transported in time to give context to where we’ve been, what led up to 1967, and how we’ve arrived where we are today. We will engage the community to develop the exhibition and the innovative companion space that will augment our telling of the story. As part of the museum exhibition experience, we will provide a gathering place for reflection, discussion and thought. Here, individuals can consider what they have experienced in the exhibition space. They will connect to activities and programs underway across the community and consider how they might become involved in moving our region forward. As we reflect back 100 years and look forward to the year 2067, we will break new ground for collaboration and how museums develop exhibits. It will demonstrate how a cultural organization like a historical society can bring a community together – both inside and outside the four walls of a museum. The Detroit 67 Exhibition experience will demonstrate how the appropriate convergence of storytelling and technology can be effective, impactful and encourage people to act. Further, given the national significance of this story, the Detroit 67 Exhibition is expected to travel. The Society is taking the lead to connect the story and its relevance outside the museum. 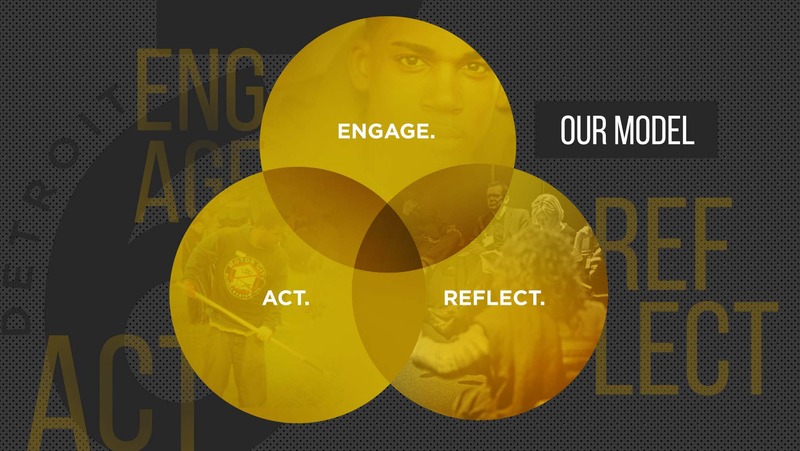 As a part of the Detroit 67 Project, we are leading an unprecedented community-wide involvement, calling on others who have social, economic, race relations, and generational expertise to lead programs, workshops and discussions that help engage the community, and connect to the ongoing story of our region. To date, over 100 diverse partners have joined us in this transformative effort. © 2017 Detroit Historical Society. All Rights Reserved.